There's no fancier pastry than macarons, those much sought-after cookie sandwiches that usually cost more money than a thing of that size should ever cost. Yeah, it's French. And yeah, it's, like, really fashionable right now, much more so than cupcakes, I think. 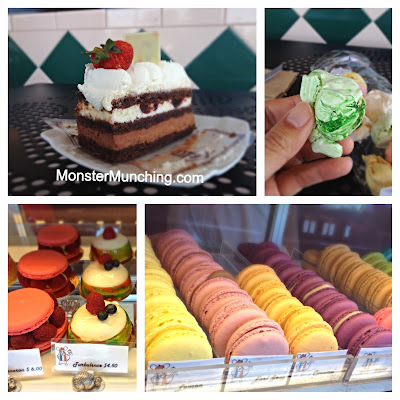 And the fact that it takes significantly more skill to make a macaron than a cupcake might justify the upcharge some of these places charge. But me? I'm ambivalent about macarons. I'd much rather get, well...everything else. And there are much more than macarons at Le Petite Sourie, a French bakery in Santa Ana that seems to have appeared out of nowhere. I tried the Black Forest cake, which is densely chocolatey where it should be, fluffy everywhere else. But then there's the meringues--the items that I think they're put on this green Earth to sell. They're packaged in clear plastic bags, about a half dozen or so in each satchel, and they're wonderful. Shaped like small meteorites, kind of uneven, with rough craters here, smooth surfaces there, you bite into one and discover that the insides are filled with just a touch of filling. Strawberry jam hides underneath the pink ones. There's pistachio (I think) in the greens, and probably mango inside the yellows. Most importantly, they got the right consistency throughout--a shatteringly crisp outer shell leading to a chewy center. Even better: they're cheaper than the macarons for the same amount of pleasure. After slurping Santoka's legendary but ultra-savory bowls of ramen at Mitsuwa's food court in Costa Mesa, you want something cold, something sweet. Until recently, that meant one of two things: Some sort of boba drink at Sky Express or a box of mochi ice cream from the supermarket. 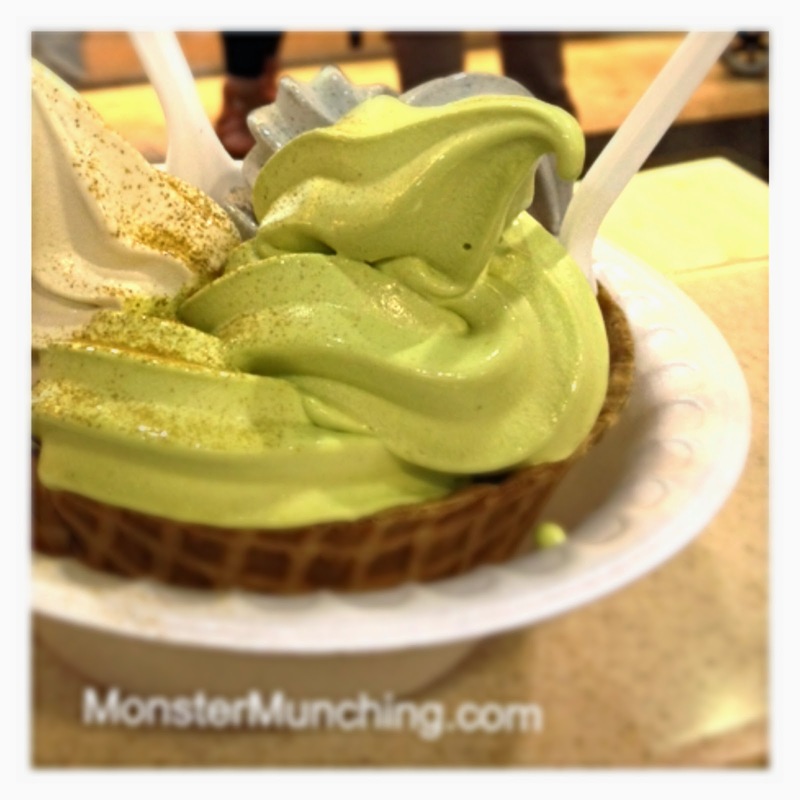 Now that Matcha Love has opened here, there's is a third and much preferable option—soft serve green tea ice cream in sweet, tannic swirls; but also a black sesame flavor that tastes like smoky peanut butter. Another tea flavor called hojicha is almost floral. But then you eat them all of them together in the same sitting and attain Zen enlightenment in a waffle bowl. You're initially pulled in by the bright pink and blue neon, but you vow to come back again for the food because you discover that Flo's V8 Cafe is one of the most down-home and decent places to eat a throwback meal in all of Walt Disney's Magic Kingdom. This is the kind of food your mom was being fed by her mom way back then, when do-wop was the bee's knees and Elvis was just being discovered. Think mashed potatoes with a well dug out for the gravy. Turkey that's all white meat, sliced up in uniform shapes that can't possibly be natural, served with peas and carrots straight from a time before peas and carrots were considered the squarest of the square. Yes, this is what TV dinners looked like when they were actually dinners people ate. And it's delicious. 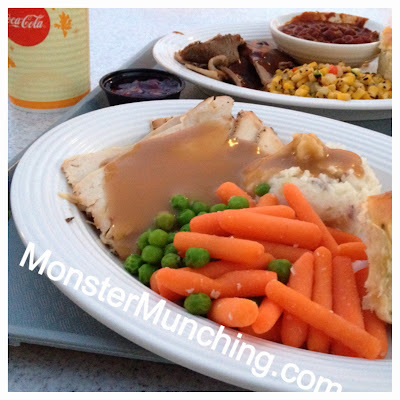 The best dish at Flo's is probably the roast beef, draped in a thick gravy as brown as the Earth. Ideally, you want the sugary, smoky, sweet BBQ beans with it as side, and some roasted corn niblets that has actual char. Wash it all down with a Coke, which unfortunately comes in a standard Disney wax cup, not in a traditional curvy Coke glass as Norman Rockwell would paint it. And for dessert, you decide you have to get this apple pie-thing baked with Cheddar cheese. It seems to have been resurrected from an old copy of Joy of Cooking or brought back to the future by Marty McFly. Ah, the proper egg breakfast. It's probably a good thing that I don't have time most mornings to sit down and eat one. It is the kind of food more suited to a weekend afternoon, when I've already taken a shower and have some sort of activity lined up that doesn't entail sitting like a lump in front of a computer for 8 hours. These are the kind of meals served at The Snooty Fox: lumberjack fuel, mounds of morning food that taste great going down but served in portions that aren't designed for sedentary lives. Besides that, corned beef hash seems to taste way better when you don't have to go to work later. And what corned beef hash this is! 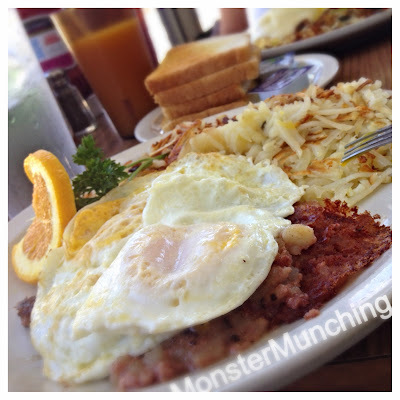 Is there such a thing as bad corned beef hash? This one is particularly great. Crisped on the edges like lace, pudding-like throughout, the dish, in my opinion, is better than bacon, sausage, or heck, corned beef itself--about the only canned meat product (other than Spam) that trumps anything fresh. And here, they serve it under a perfectly cooked egg, and next to a nest of hash browns or the house "Those Potatoes" (which are hash browns with bits of onion and peppers in it) that are so crispy, it's almost like eating a Godzilla latke. The Snooty Fox has been around forever. The name seems to come from a time when The Velvet Turtle and the like were on top of the food chain. The furniture looks like it's from your grandma's dining room, and the servers are, if I'm not mistaken, actual grannies. The place is not unlike those Midwest diners where the regulars are harassed by politicians on campaign trail photo-ops to show they're men of the people. But the food is great, made with care and from scratch, and every plate is still garnished with a sprig of parsley and brought out seconds from the stove on which they're cooked. 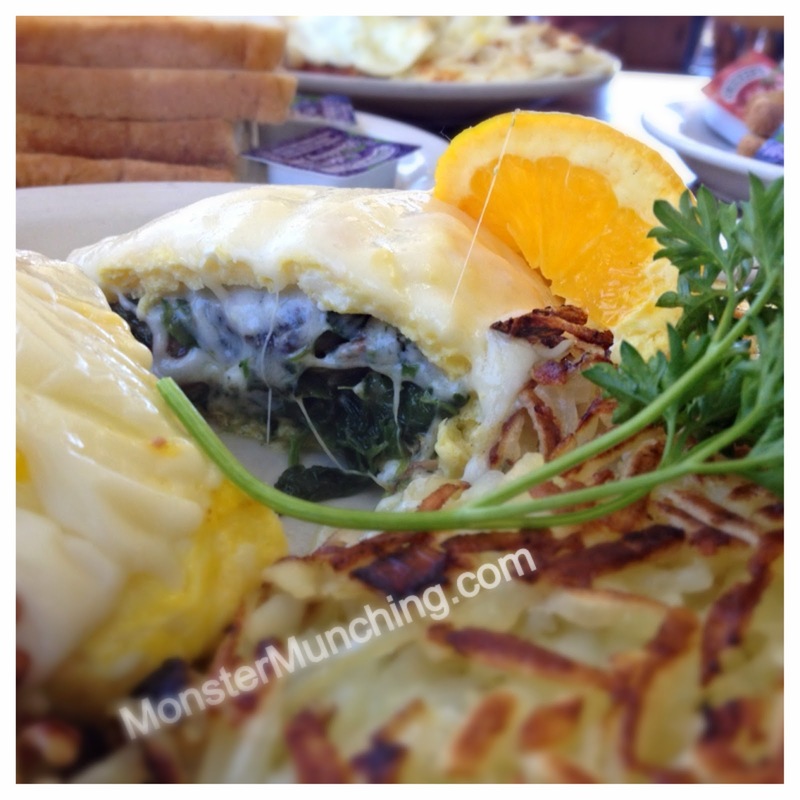 They have this permanent special called the Spinach Delite, and it's indeed delightful, a 3-egg behemoth filled with spinach, mushrooms, bacon and gilded inside and out with cheese. The spinach is steamy, fresh, probably the best spinach I've had outside of a Chinese restaurant stir-fry, and perhaps even better than that.